Lately I have been working on several interesting projects; special orders and prototypes for local shops. This week I finished a special order of little cups for the Center of Wonder in Jackson, WY. Since this organization is dedicated to creating moments of wonder and supporting creativity in our community, it seemed appropriate to make each cup just a little different. In order to add a bit of personalization, the Wonder Bird logo is on the inside of each cup. This took some trial and error, in the end I made a stencil using contact paper. Simplifying the logo then adding the details made this process a little simpler. First, using underglaze, I would paint the positive or negative of the simplified bird into the base of the leather hard cup. Next I would peel off the stencil and paint in the details or scratch them out of the black: eye, feet and curly tail. The finished cups are super cute plus I got more confident with making, using and altering stencils. Often these projects help me figure out different ways to approach my craft and sometimes the techniques show up in future work. It took nearly a month after the first install (for details check out Part I) but the clouds have finally gathered on the Wonder Spot. The final addition is a cloud over 8 feet wide that hovers at the top of the sign. The clouds take shape upon approach. Once up close, all the parts and pieces used to make each form are visible. At this point it is as if the cloud particles have been magnified, similar to being inside a cloud where the edges are no longer visible. This has been a tough sculpture to photograph! Better photos will be added to my website over the summer, for now I've been snapping quick pics on my way in and out of Jackson. When driving north past the clouds there is a spot where Sam's giant steel boat on top of Jackson Hole Whitewater appears to float through the clouds. (Check out this video of the boat when it was in the sign a few years ago.) At night clusters of light within the clouds are reminiscent of a far-off thunderstorm. 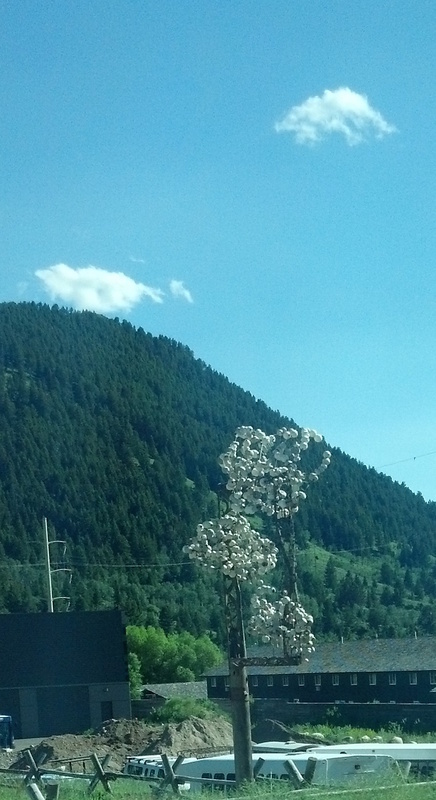 The clouds will be up until late fall, so if you are in Jackson check them out as you are driving by! 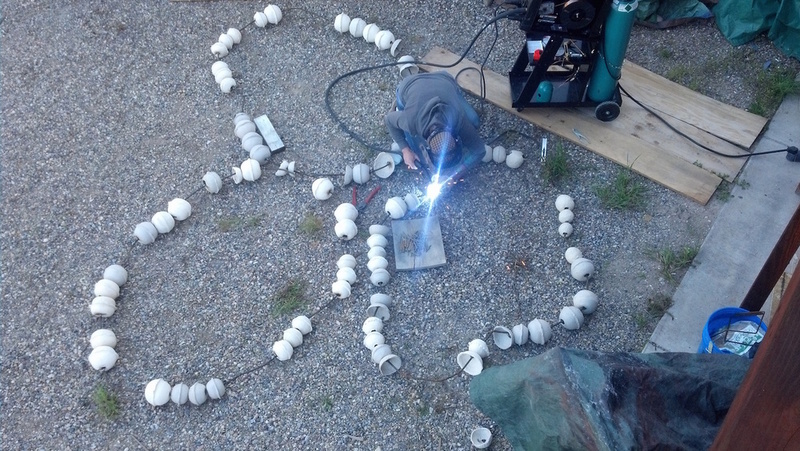 For the past several months I have been working on a large-scale project: creating a sculpture capable of living outdoors for 6 months. The Wonder Spot is 10 feet tall X 6 feet wide and stands about 10 feet off the ground along highway 191 as it winds north into Jackson, WY. This tiny maquette is a simplified view of my vision. You've just arrived in Jackson (or you are heading to work) there might be summer traffic slowing down your progression... what's that? A group of clouds have gathered on a sign? Here is the first installment of the process behind what will be a month long installation... The Clouds are Gathering. 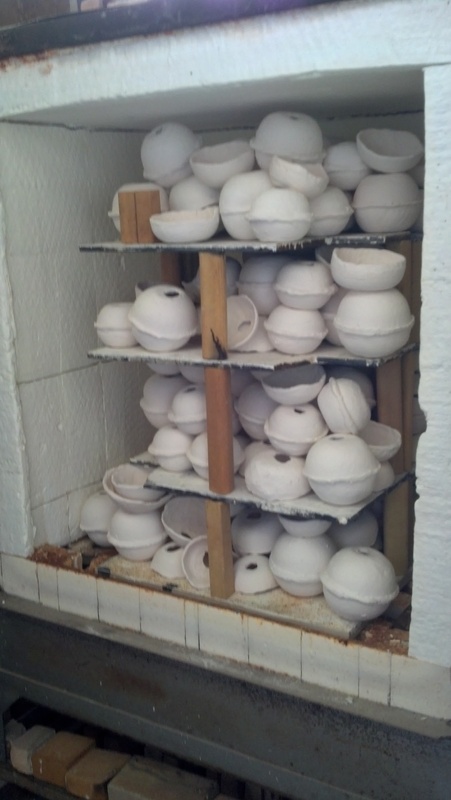 I started out by making hundreds of ceramic balls, using plastic bowls as moulds. This has been a great way to use up the mounds of recycled porcelain piling up in my studio. My husband, Sam was the muscle behind bending the steel rods (our landscaping came in handy) and has helped brainstorm and problem solve at every step. I'm finishing the huge cloud that will go on top, plus making tons more ceramic orbs to help fill in some gaps in the 2 small clouds. In a few weeks we will meet for the final install and the clouds will finish gathering. In the meantime, they subtly hover on the Wonder Spot. I had a team of awesome helpers- thank you! Now I'm looking forward to finishing the next step!